last week we attended an event at makati shangri-la. there were lots of people. there was flowing drinks. there was tons of food. there was the sushi station, the pasta station, the dessert station, but this was our favorite section: the bag station! well, they were not serving real bags. 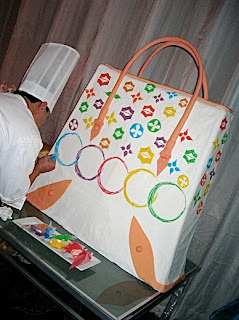 here is the artisan putting the finishing touches on the giant bag cake: and here's the finished product. 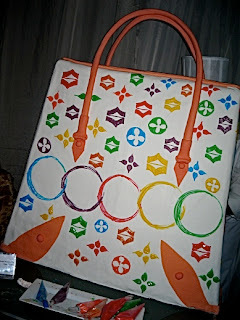 now doesn't it resemble a certain bag style by a certain french brand that collaborated with a certain japanese artist? we even got to take home one of the mini totes... eye love it! eye like it too! was it yummy? 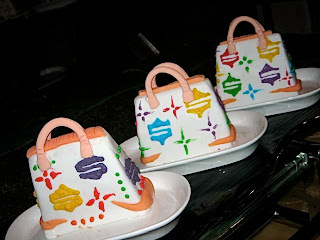 ang cute naman ng little bags... was it good?